I’ve noticed a disturbing trend. Customers call us wanting to know all of the background about the hows, whys and formulas of a chart. I think they are afraid someone will challenge or ridicule their analysis. Here’s what I think. Continue Reading "Fear of Ridicule and What to Do About It"
Posted by Jay Arthur in Improvement Insights, QI Macros, Six Sigma, Statistics. People have been trying to make statistics simple and easy to understand for decades. But statistics aren’t simple. Maybe we should change how we teach them? Continue Reading "Statistics are Simple"
Posted by Jay Arthur in Improvement Insights, QI Macros, Statistics. I have found that an XmR chart is the easiest way to display attribute data. Simply convert the numerator/denominator into a ratio and plot the ratio. Almost two decades ago, Tom Pyzdek said: X chart provides an excellent approximation to the p chart. More recently, Donald Wheeler noted that XmR chart limits will be very close to c, np, p or u chart limits if the underlying distribution is correct. Continue Reading "Use XmR Charts instead of c, np, p and u Charts"
Posted by Jay Arthur in QI Macros, Six Sigma, Statistics. What USL/LSL Do I Need for Cp>1? Customer asked me what seemed like a strange question: What specification limits do I need to get a Cp greater than one? Usually her customer should set specification limits, but her boss wanted to know what they could deliver. Hmmmm! Continue Reading "What USL/LSL Do I Need for Cp>1?" At IHI, I spoke with one Quality Improvement Adviser who was getting blow back from certain statisticians in her organization. They were challenging her methods and tools and analysis. As I have written before, I call these folks “Stat Bastards” because they belittle others rather than help them. As a member of the American Statistical Association, almost every statistician I meet is incredibly kind, generous and helpful. The few that flaunt their training rather than helping are impeding the forward progress of their organization. I say, if they have better data, bring it. If they have better analysis, bring it. If they have better tools, bring it. 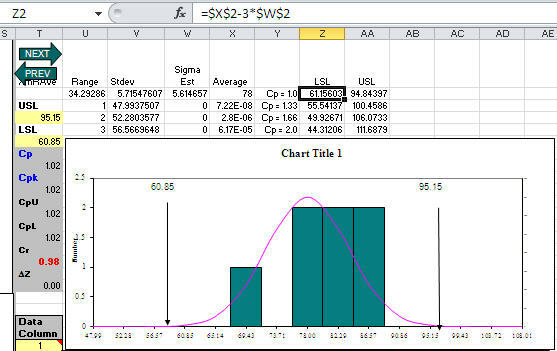 Posted by Jay Arthur in Six Sigma, Statistics.